As usual, I learned a lot while working on this book. For example, in the manuscript I first sent to the publisher I referred to "frogs, and their close relatives, toads." That seemed to be accurate, based on my research. However, a herpetologist who read those words made it clear that scientists do not consider toads to be anything other than frogs. They are ALL FROGS! I had also used the term "poison dart frogs," but learned that herpetologists prefer to all them simply "poison frogs"--except for those three species that were actually used to poison darts. The book was published with a mistake in it, but not the sort of mistake that could have been prevented. Here's what happened: on page 11 I wrote about Earth's biggest and smallest frogs. I told of two species, the gold frog from Brazil and a Cuban frog that are tied for the title of "world's smallest four-footed animal." That was true: until January 2012! Then discovery of a new, even smaller frog was announced. born as tiny miniatures of the adults." I hope you will read the Author's Note--A Life Full of Frogs, at the end of the book. 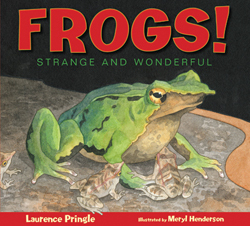 The reviewer of Booklist, Carolyn Phelan, wrote, "An enjoyable author's note relates Pringle's close encounters with frogs as a child, as a father, as a wildlife photographer, and as a neighborhood ecologist acting locally to protect and even create anuran habitats."